Come along for an evening of all things coffee! Our coffee school evenings start with an introduction to speciality coffee, how it’s grown, processed and ethically sourced. This is followed by a live roasting demonstration with a step by step explanation of the roast and the roast profiles that we use, along with how we control the roast during the process. We always roast our coffees by hand and use our sensory skills to monitor the coffee. You will be able to observe the colour change in the coffee and smell the beans at each sensory milestone. We finish off the evening with a mini brewing workshop in our tasting room. At this stage, we will talk about grind sizes, brewing devices and brewing ratios to help you achieve consistently good coffee at home. Do you have a coffee question that you’ve always wanted to find out the answer to? 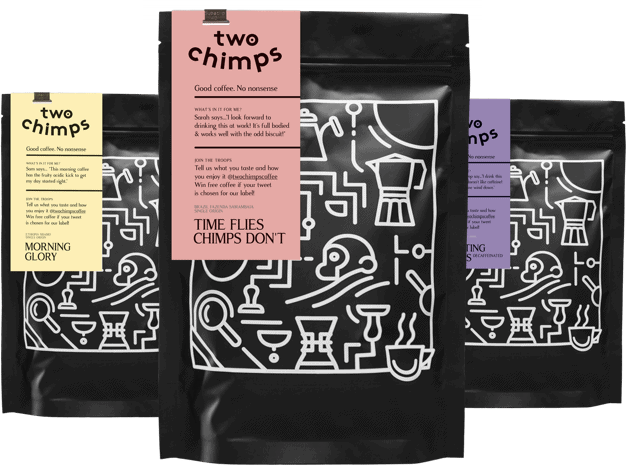 The team of chimps will be on hand throughout the whole evening to answer any questions related to coffee. At the end of the evening, you can purchase any of the devices used or some freshly ground coffee so you can practise your brewing skills at home. However, there is no obligation to do so. To ensure that all students can make the most of the evenings, we have a limited number of spaces per course. The evenings start at 7 pm and will last for around 1.5 – 2 hours. With unlimited coffee for you to drink you’ll be buzzing ‘til the cows come home! Don’t worry though – a decaf alternative is always available if you’d prefer. Book a free place for you, and your friends here.